Grand Park celebrating its 1st birthday! Celebrate with them by visiting Sprinkles Cupcakes DTLA between October 7 – 11. Buy 6 Grand Park cupcakes during this week and Metro can get you a FREE cupcake of any flavor! All you have to do is show your TAP card to the cashier at Sprinkles DTLA. The exclusive offer is part of Metro’s Destination Discounts program and cannot be combined with any other offers. Go Metro to participating locations and events and you’ll save on admission, get discounts on meals, and receive free gifts. 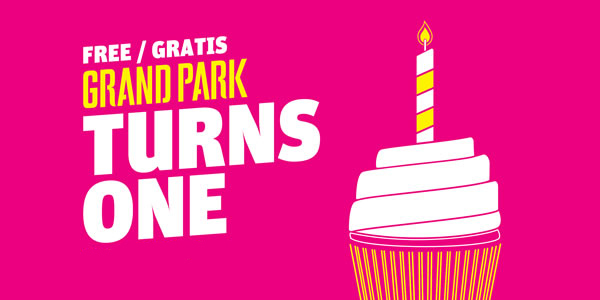 You can grab a sweet treat any day during birthday week, but the Grand Park birthday concert takes place on Thursday, October 10 at 7 p.m. and you definitely shouldn’t miss it. Sprinkles DTLA is located on the second level of FIGat7th in downtown Los Angeles. Take the Metro Blue, Red, Purple, or Expo Lines to 7th Street/Metro Station. Continue to Grand Park on the Red or Purple Line to Civic Center Station or Metro Bus 10 to Hill/Temple. All the hullabaloo about Grand Park; what is the big deal about it? I just do not see it. During the 1970’s I worked in the Civic Center and used to eat lunch in that park. I think the park looked better then than it does now. All the money that was spent to redo that park and it does not look much different now than it used to. Yes, there are new benches a few other new things in the park; but basically there were more trees and more shade available. A lot of the former trees must have been removed. Too bad, I liked it the way it was. The new change really does nothing for me.